The frontend of my site is connecting but the wp-admin section is showing the error establishing a database connection. Thanks! Life saver. Completely borked my site changing passwords. Could have sworn I’d done everything right but managed to fix it in config. My problem was due to a google analytics plugin, the day i installed it, my site was down saying “Error database connection!” Even I was unable to login into my admin panel. So, I manually removed that plugin from cpanel, and everything worked. thank you for your info. Can you please explain how to find particular plugin in cpanel to remove it? I received this error message right after I’ve installed “All in one SEO pack” plug-in in my Worpress site so I guess it could be the same problem as your problem was…? I was on a Digital Ocean 512MB droplet and was getting this error every couple of weeks. Inspecting the logs showed that a process called update-apt-xapi was consuming all of my memory and causing the mysql service to crash resulting in the error. You can try setting up a swap file but, really, 512MB just isn’t enough memory to run a WordPress install. Upgrade your droplet to 1GB and that should take care of the issue. We have the same issue here friend. How’s your website going since? I was trying to cheap on server expenses now. I just checked MySQL server with “service mysql status”. Apparently, MySQL server was not running. So, I started it with: “service mysql start”. And Voila! my website was up. I did a search through your post and didn’t find anything about SELinux being the culprit, which ultimately was my problem. I have segregated my web server from my database and disabled SELinux on both VMs. I tried your testconnection.php, which was successful from within the /var/www/html directory before disabling SELinux, so I really have no idea if it is the database or the web server that has the issue. I will try and update this comment with SELinux settings that work when I have tested it. I have this problem right after having changed the password for my admin access. Can you super kindly provide a solution written in a language understandable for someone who has close to 0 programming or web-developer knowledge?? I have the error for both front-end and back-end. I have NO IDEA how to “check the wp-config.php” file (never heard of it until now). How do I proceed? What did work for me was this: In cPanel, go to Advanced Zone Editor select the domain copy the recorded IP and as wpbeginner suggested I replacing localhost with the IP and it works! Thanks! I was having the connection problem. The problem was my previously installed MySQL, was running. So I stopped it and then ran MySQL of Xampp. It worked. Hope it helps. My previously installed mySQL was running. I stopped it and then ran mySQL that came with Xampp. it worked. Hope it helps. We had our wordpress installed on AWS EC2 and we got the “Error establishing database connection” for all our sites when the database was installed on the same server as the web server. When the database was moved to Amazon RDS for each of our sites, that error did not recur. This helped me a lot with a WP installation going bad. Thanks! I have recently experienced the same issue when moving my multi-site from a subdirectory to root. Even after going through all the steps outlined in various tutorials, I encountered this dreaded message and nothing I did seemed to work. What did work for me was this: In cPanel, go to your softaculous script installer, select the edit icon for your WordPress installation, change the paths that point to your install. Once I did this and saved, then navigated to my site URL, it was back up and running smoothly. Just wanted to leave this here in case it helps someone else along the way. Thanks man, it work on ngnix server due to error establishing. I have an issue with database connection. I wanted to create a new database for a new website #2 connected in multisite in OVH, and when wordpress asked me to enter login, password etc I entered those of website #1 as I had to do BUT without changing “wp_” for “wp_2″… And now both of these two sites have the message “Error establishing a database connection”. I deleted all FTP WP for website #2 and deconnected from multisite, but impossible to get back and to enter in website #1!! Do you know how to resolve this problem? I’m having an issue with my website, my WordPress database just seams to disappear. logged into MySQL and nothing exist there anymore. has anyone ever experienced this? anyone with a solution? The cause of this issue when I had it was so many people running hacking programs against my login page that they were impacting the server. It happened every Friday evening through Sunday evening. We eliminated the issue by protecting that page with a pop-up so they couldn’t run their automated hacking programs against the login page. Thank you for posting this–it saved a bit of a panic when the company’s WP blog disappeared behind this error. After verifying that the database was still there and undamaged, I called our host. Turns out they’ve been migrating customers’ web sites to new and improved servers, and they somehow lost the connection info. Hopefully it will be repaired today. But a very informative article, and a quick reminder (for me) of how to check in on mySQL to make sure everything is still good. Thanks! Thanks. Helped me debug a DB backend issue. How can i find my wordpress database username and password? By Mistake, i have deleted wp-config.php file and now i have uploaded new files. Are you sure you have the correct username and password? Are you sure that you have typed the correct hostname? Are you sure that the database server is running? If you’re unsure what these terms mean you should probably contact your host. If you still need help you can always visit the WordPress Support Forums. You can login to your hosting control panel and locate the MySQL database section. Most likely, you will be able to find the database name, username, and password information there. Alternately, you can contact support to help you locate that information. Thanks so much, all, for maintaining such a great website! You guys continue to bail me out with problems, issues & fixes for those of us who just enjoy writing & posting and not dealing with all of the WordPress programming stuff. Great work! Thanks for all the great articles. I am having such a problem tho just getting WP installed. I’ve followed your instructions regarding doing it with MAMP and keep getting the “can’t connect to localhost:8888” msg. After much searching I found a terminal code to test apache. It returned with httpd not running, trying to start. I did it again and it didn’t return anything so perhaps worked. I tried connecting to local host again and this time I got Error connecting to database. At least this seems like progress! I tried some of your suggestions above and this time, it seemed to be trying to connect for quite a while, but finally gave me the Error connecting to database again. I have yet to get the happy WP page. Does anyone at all have any ideas as to what is going on? I have spent hours searching, contacting, trying this and that and I don’t know what else to do at this point. I am an absolute WP beginner. Thanks to anyone/everyone in advance. Hey! Were you able to figure it out? I’ve tried all of their solutions and I’m still stomped. Hi Ashley, No, unfortunately nothing is working for me either! I’ve yet to find someone who knows the answer & have been asking many places. For me, I think I’m going to use different software and leave WP for another time. Too strange, too much hassle. This isn’t a WordPress problem, it’s a MAMP problem. If you have to run this on a local server, try a different XAMP package. Better yet, get a shared hosting account and set it up there. Local XAMP can be frustrating. I missed that when you add the repair line to your WP config file you have to add it right at the end of the declarations before the first “if” statement when I first read it. Took me a while to realize what I was doing wrong. Still didn’t fix my problem but at least I was able to strike one possible issue off my list. Thank you for a great helpful post. Solved by resetting DB password but this process repeated several times. issue solved but page speed is too much slow now. Also had the same problem and tried everything. TestConnection was failing. What I just had to do was manually edit the user password through MySQL Cpanel and it suddenly worked! I am so confused. First time on wordpress. No tech experience whatsoever. I didn’t receive any error. message. My website is up. The problem I had is when I set the page to update some updates would take effect and others didn’t. I called WordPress and they told me I didn’t set up the database correctly. Is this the same issue as this article or something totally different? Thanks in advance. Hi, i had this problem when I formatted my laptop and reinstalled XAMPP. So, maybe the problem is not that the user has not enough permissions… perhaps the problem is, user simply doesn´t exist yn mysql.user table! (as I said, it can be possible after formatting your computer). I just had the same problem, which I managed to solve by simply changing the DB password and correcting that in the config.php file. I have no idea why the password suddenly became an issue, though. Changing the localhost in my wp-config.php to the ip on my host account in godaddy cpanel did the magic for me. Even godaddy support were talking rubbish. Imagine telling to upgrade with about $200, that my hosting plan is low on resources. I almost believed until I found this article. Thanks a lot. I still have the problem. GoDaddy tried but unable to help. They have a service that, for $80.00, will have a WordPress expert investigate. However, there are no guarantees she / he can fix the problem but you still have to pay the $80.00. I had a similar issue with installation on windows server, I kept getting database error, and what I did was to replace localhost which was internal server to IP Address and Port which was external server and it worked perfectly. Mine just happened like 20 minutes ago, I am hosting at Ipage and WHAT A SCARE!!! It happened all over sudden and I could not access both the admin site and the website itself with my laptop but I could access the site with my phone. Then before I could complete reading this guide the site got back by itself lol. I want to know if there is a way to avoid this from happening in future. The same happened with my site. Very strange! Nice article. I want to know about the AMP errors and how to fix them ? This was helpful, Thank you very much. I always rely on WP Beginner when struggling. my website is showing database connection error . Thanks much for the article. I ran into the same issue. THIS IS WHAT HELPED ME FINALLY. I was able to repair using the options available in phpMyAdmin and got my site back. Thanks all. hi there.. can i please seek help.. i am working now on transferring my live WordPress site to local using XAMPP.. my database is doing good but i cant connect it during the WordPress installation. please help.. thanks in advance! Thank you for this article. My website was hacked recently and after I got no support from the hosting provider, I was told I was going to need to reinstall WordPress and upload the backup. I didn’t use a backup plugins (I am all the way in South Africa) as it is to expensive for the paid plugins. So I did a cpanel backup through Softaculous and downloaded the Zip of 1.03Gig. Two weeks later my site was hacked (Twice in one week). With the second hack my wordpress installation was comprimised – and backup deleted from server. So I had to delete the original installation and reinstall. Now I followed all the steps to upload the zip to file manager and now I am stuck with this: Error Establishing a Database Connection. I have tried all the suggested solutions from this post, but still no progress. Please help me! I am quite new to wordpress and this is my biggest client’s website. The most common reason for this error is incorrect Database information in your wp-config.php file. 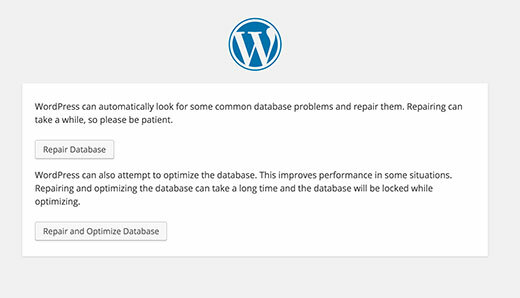 Confirm that you have restored your WordPress database correctly, then enter the mysql host, database name, database username and password carefully. If you are unsure, ask your hosting provider and they will let you know your mysql host and other information. Some folks suggested that they fixed their problem by replacing localhost with the IP. Any logical explanation for this…? Think about it. ‘Localhost’ is the name of a location. If changing that to the IP works, then ‘localhost’ was not pointing where you need it to be. Thank you for your article, it was very informative and helpful in getting my issue resolved. I have MAMP installation on my Macbook. i.e I am running MySQL also on my local machine. My problem was that in wp-config.php, the database server ‘localhost’ is not working. Once I changed it to 127.0.0.1, it started working. What does it mean if testconnection.php is just a blank white page? Repair database command worked for me. What i did was, in the cPalen i went into MySQL databases and scrolled down to current user and changed the password. I used the very same password that was in my wp-config.php file but for some reason the password was corrupt. Everything works fine now. I got this error on a client’s site. After a bum steer chatting with a Bluehost tech, I called back and the phone tech support person I got did this same @JP Hoey trick (changing the DB pass and updating it in wp-config.php). Took 5 minutes and worked like a charm. Don’t use #’s in your password. I had two hash tags in my password that was throwing something off in the PHP–since hash tags create comments I guess. I removed the hash tags and BOOM, I’m in. I tried almost everything outlined in the article but can’t fix my problem. Here is an outline and history. I have installed MySQL 5.7.17 and MySQL WorkBench 6.3.8. And WordPress 4.7.2. The MySQL was installed after removing both an earlier version of MySQL and WorkBench. The previous version was displaying the same database error. The previous WordPress/MySQL worked about 2 years ago, but recently I contracted a project to develop a WordPress Web site, and I encountered this problem when I began setting up the new WordPress framework for this new site. The old WordPress site was deleted so I couldn’t test if that worked. So, I reasoned, why not try a fresh start and also upgrade to the latest versions, etc. But, this new version also had the same problem with not being able to connect to the database. I have narrowed down the problem to “permissions” and I haven’t been able to crack the code. I have created a new WP directory and installed a fresh WP version etc. I deleted and created new databases in WorkBench and properly assigned them users and passwords. I have checked the Users and Privileges, Client Connections and can find nothing that would block access to the database. I have checked my Windows 7 permissions for the MySQL Directory and the sub directories. I have unchecked the “Read Only” to the master MySQL Directory and all directories and files are read/write. I have progressed through each attempt to connect to the database each time I change something. I am exhausted and very disappointed there isn’t a good response by the WP Support Team to this issue of “not able to select the database.” It is a “popular” issue that many developers are experiencing with no resolution–many more experienced than me, are having.